It is possible to detect the influence of France in Moroccan cuisine, not unsurprising as the countries have historical links. This dessert feels as if it is closely related to the French dish Clafoutis (or it’s close relative Flognarde), although the egg custard is replaced by a sweet ground rice pudding mixture. However the addition of rose water (or orange flower water, which is listed as an alternative) firmly connects this dish with the southern shores of the Mediterranean. 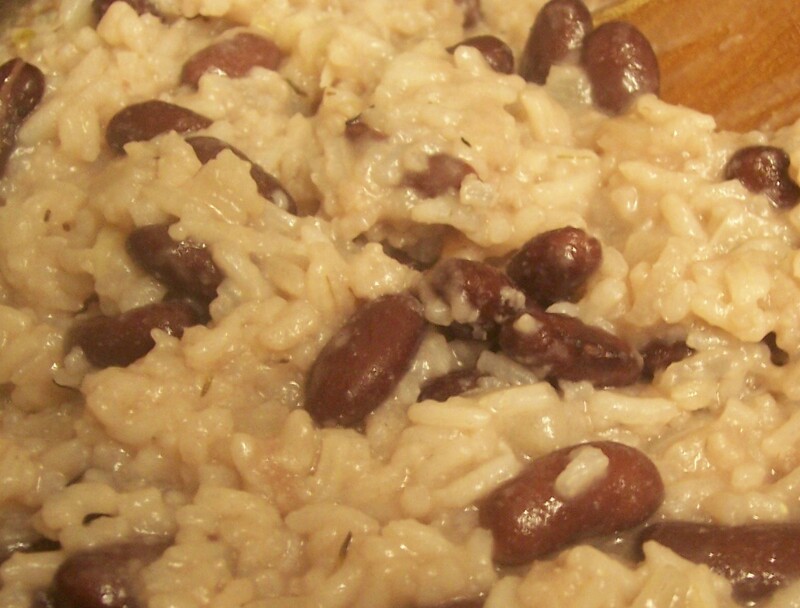 The suggestion of rice pudding might make the casual reader feel that this is a rather homely dish, as they are usually linked with nursery food rather than dinner parties. However this would make an unusual and delicious dessert as part of N African style meal, especially made in individually sized portions. The recipe comes from a wonderful book I found in the library, Illustrated Food and Cooking of Africa and the Middle East: A Fascinating Journey Through the Rich and Diverse Cuisines of Morocco, Egypt, Ethiopia, Kenya, Nigeria, Turkey and Lebanon by Josephine Bacon and Jenni Fleetwood (to give it its full title). The ingredients are all as listed in the book, except I found it necessary to increase both the ground rice and sugar by 1tbsp. This increase of the sugar content is, of course, optional but is recommended for those with a sweet tooth as plums can often be acidic. I made the original suggestion of Plums combined with Rosewater, but other fruits could also be used. Orange flower water is a suggested alternative addition and I can imagine that this would be delicious used in combination with Apricots or Peach. The addition of flaked almonds adds a lovely crunch to the smooth texture of the ground rice: don’t be tempted to omit them. 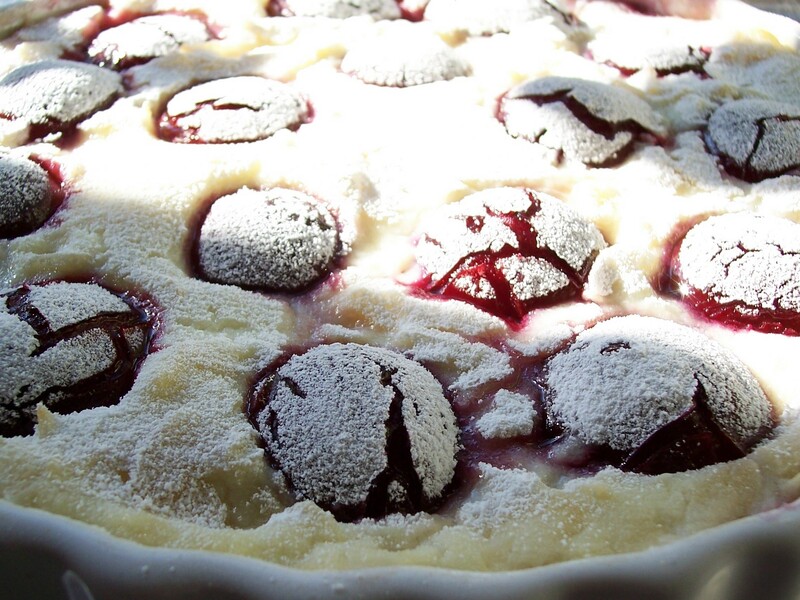 Finally, I added a generous dusting of icing sugar, which enhanced the cracks in the surface of the plums and where their juices had run into the whiteness of the rice. I further handful of toasted flaked almonds on top would be a good addition, athough not included in the original recipe, particularly for a special occasion. 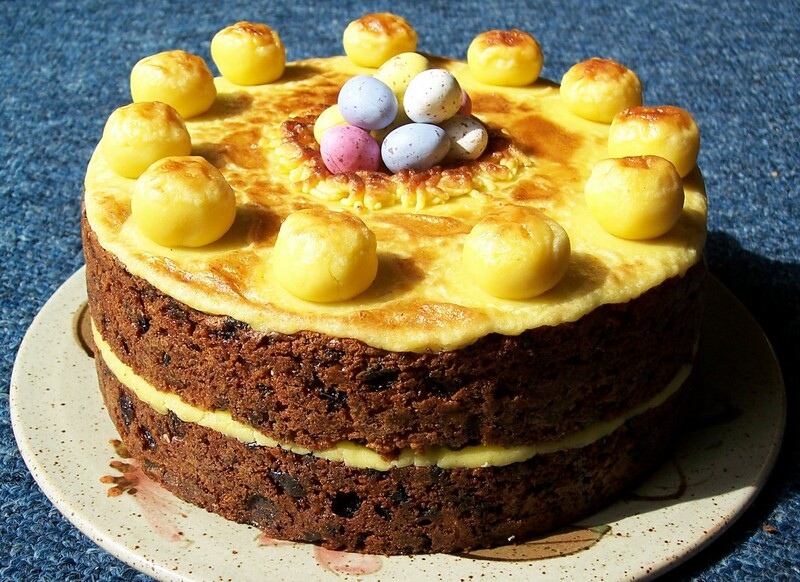 I am sure this recipe could be made a short while in advance and reheated just before serving, although I would add the sifted icing sugar and additional split almonds just before taking it to the table. 1. Preheat the oven to 190oC/370oF/Gas 5. 2. Remove the stones from the plums and halve them. 3. Bring the milk to the boil in a pan. 4. Blend the ground rice with the cold water, a little at a time, mixing well to remove the lumps. Pour the hot milk over the rice and return it to the pan. Simmer over a low heat for 5 minutes, stirring constantly, until it thickens. 5. Stir in the caster sugar and flaked almonds. Continue to cook for 5 more minutes. 6. Stir in the rosewater (or orange flower water). Simmer for 2 minutes. 7. Butter a shallow ovenproof dish. Carefully pour in the almond rice mixture. 8. Gently arrange the prepared plums (or other fruit) on top, spacing them as evenly as possible. 9. Bake for 25-30minutes, until the fruit has softened. As it cooks the fruit juices will run slightly into the white almond-rice mixture, which is unavoidable. 10. Dust with icing sugar and serve immediately with a little pouring cream or crème fraîche if you like a slightly more sour taste. 11. Scatter with a few toasted split almonds to decorate. Plain boiled rice is a usual and perfectly satisfactory accompaniment for Indian food but a Pilaf or Pilaff (or Pilau as it sometimes appears on menus) is so much better: fragrant rather than hot and especially good when entertaining. This method is very simple and it combined well with the Makkhani Murghi (Tandoori Chicken in a Butter Sauce) it accompanied: a favourite chicken dish I often serve when entertaining. I am sure I will be making this Pilaf rice regularly from now on. The original recipe comes from Nigella Lawson’s book Feast: Food that Celebrates Life, which was one of my Christmas presents. The original title is Pilaff for a Curry Banquet. I always use my rice cooker when cooking rice but this time I followed the recipe method and made the pilaf on the stove top which was very simple and straightforward. I am sure it could be easily adapted for a rice cooker, unless of course you are using this for plain boiled rice, as suggested in the original recipe as an alternative extra dish. I have recently been watching repeats of the television programmes that accompany Keith Floyd’s book Floyd around India and took his advice to use red onions in Indian dishes as they are sweeter. They also added a lovely pink hue to what could be a very white dish. Rather than a tea towel, I used a clean square dish cloth to cover and help seal the pan as it seemed a better fit. I suggest that this step is not left out as I think it does help to seal in the heat and moisture as the rice rests, stopping it from drying out. I have also increased the onion and some of the spices a little as we like a more pronounced flavour. 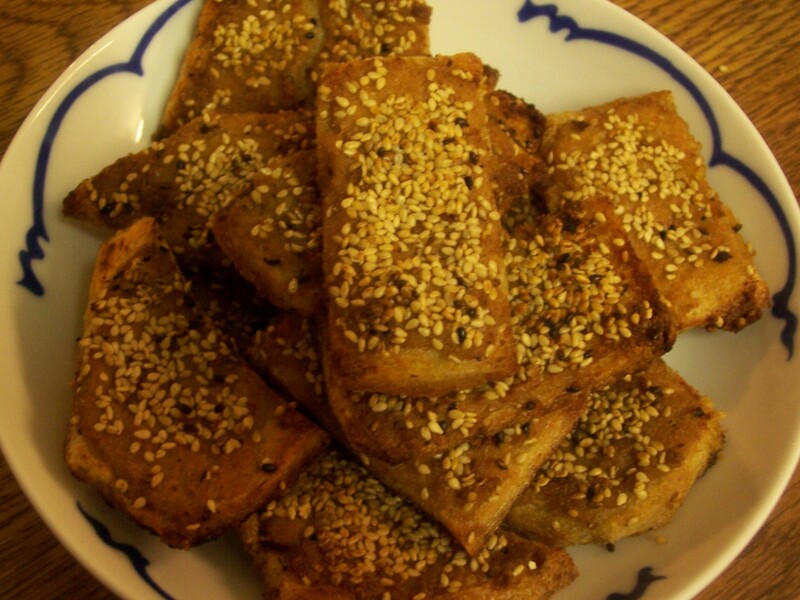 We love Nigella seed (also called Kalonji, which can be bought in ethnic grocery shops and large supermarkets). Our local Turkish bakery uses it, along with sesame seeds, on top of their bread and it is delicious! The original recipe says it is optional, but do try to get it if at all possible. 1. Heat the oil in a deep saucepan and gently fry the onion, cloves, cardamom pods, cinnamon stick, cumin seeds, and nigella seeds for about 10 minutes or until the onion is soft and lightly browned. 4. Turn off the heat, take the lid off, cover with a tea towel and clamp the lid back on the saucepan. With the rice cooker this can be done when it has reached the ‘keep’ setting. The rice can be rested like this for at least 10 minutes and up to about 1 hour, so it can be made a little ahead of time if entertaining. 5. 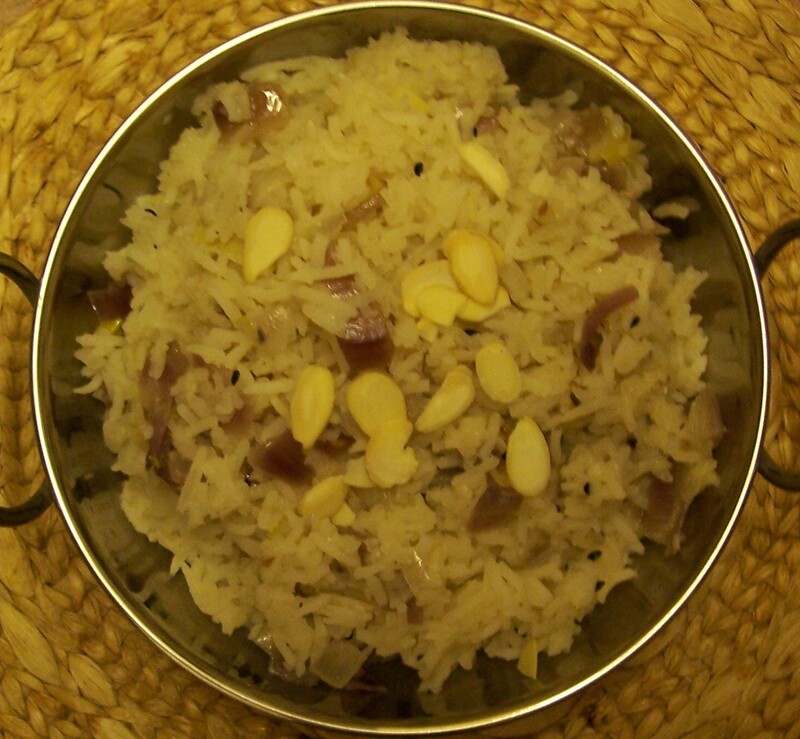 Just before serving, fork the rice through and scatter the toasted flaked almonds and chopped fresh coriander on top. It is not necessary to remove the larger pieces of spice before serving, although you may prefer not to eat the cardamom pods, cinnamon stick and cloves. On holiday with friends in Corfu many years ago, 1983 to be exact, we regularly ate at a welcoming beachside taverna. 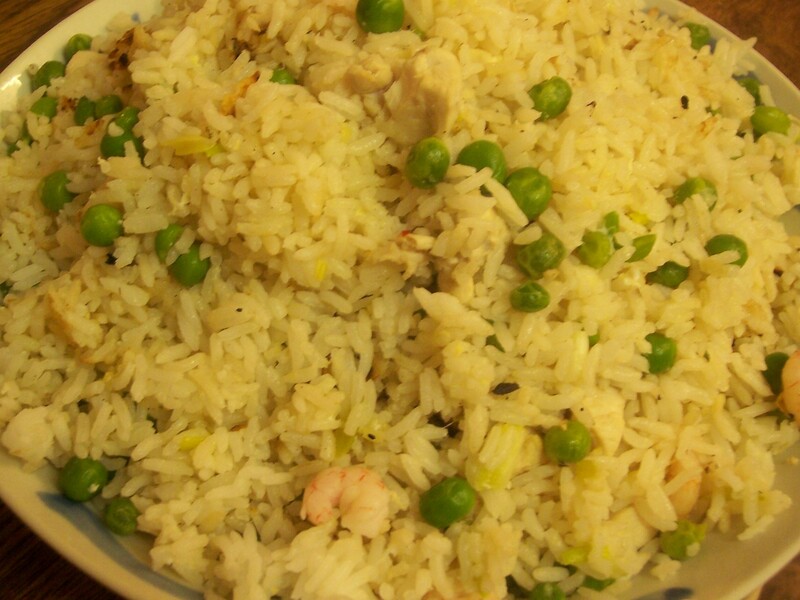 One of the recipes that I really enjoyed was delicious but simple dish of chicken and rice. Served in individual casseroles, there was a succulent piece of chicken in a tomato sauce and underneath it a bed of soft rice. I am sure it had some Greek flavours, but it is rather too long ago to remember exactly. This recipe, although not Greek style, does go part way towards the dish from my memory, but rather than being a Summer dish, is instead a firm favourite in our house and especially good and warming fare for winter. I like to note down the date I first made recipes in my books – by this one I’ve written 26 January 1990: almost twenty years ago. This version comes from The Complete Farmhouse Kitchen Cookbook: the original recipe was simply called Chicken Casserole but I have used the title I use when we eat it. 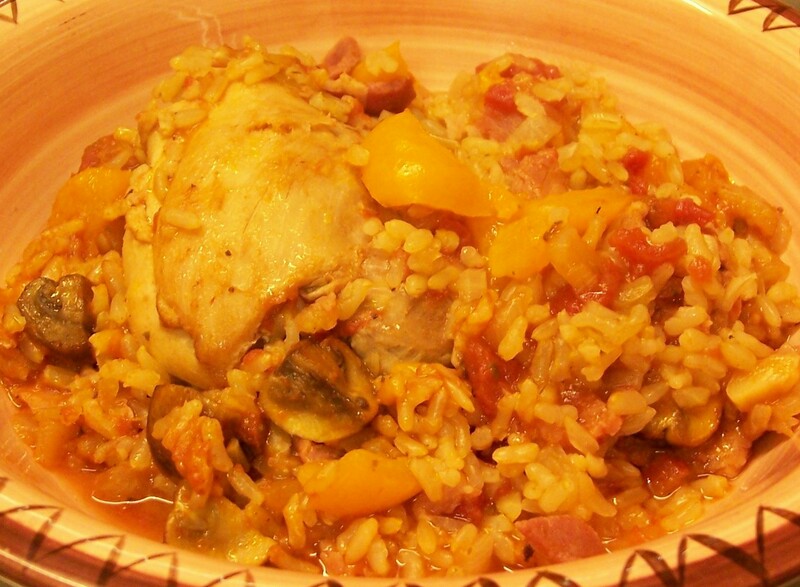 The recipe suggests using either white or brown rice. I find brown rice is lovely and nutty and worth using if you have the time as it takes extra long to cook by about an additional 20-25minutes, depending on the type of rice you are using. I have also made a few amendments and additions to some of the ingredients originally listed, adding garlic, bacon plus a yellow and/or green pepper. My original notes also suggested a possible oriental variation omitting the herbs and sugar and adding ginger, a little soy sauce and chinese seasoning. I don’t ever remember cooking this so must try it sometime and if it works add a supplementary post. This does freeze well too, so it is worth cooking double. 2. Heat half of the butter with the olive oil in a frying pan. Remove the skin from the chicken if you wish and gently fry the pieces on both sides in the butter/oil mixture until lightly browned. Transfer them to a casserole, leaving behind as much oil as possible. 3. Add the onion, garlic and celery to the pan and gently cook for about 5minutes. Add the chopped bacon and rice and stir well. 5. Transfer this mixture to the casserole, covering the chicken joints. 6. Bake in the centre of the oven for 1 hour. If the casserole dish is likely to overflow then place it in a baking dish to catch any drips. Check to see if the rice is cooked. Brown rice could need another 20 minutes plus, but even white rice may need a little more time. 7. Fry the mushrooms in the frying pan in the remaining butter for 5 minutes and add to the casserole for a further 5 minutes in the oven. 8. Serve in bowls accompanied by a lightly steamed green vegetable: beans, peas or broccoli are idea. 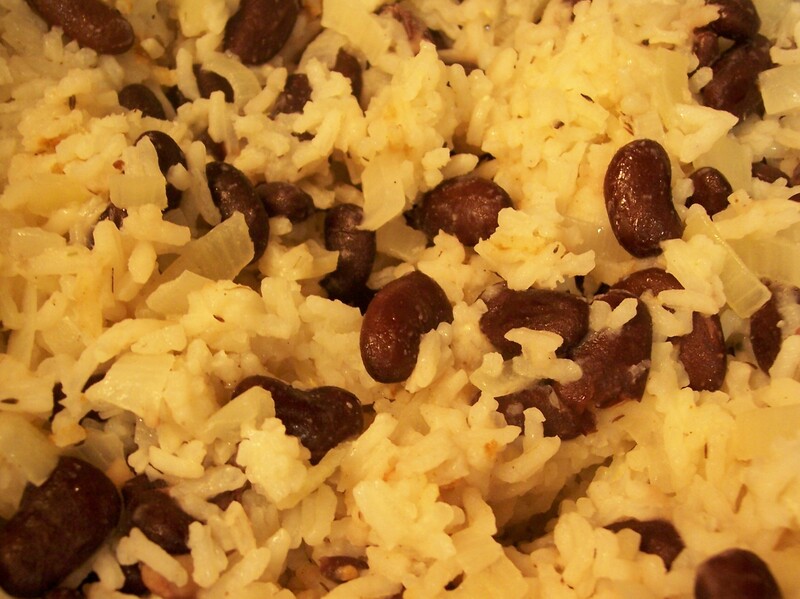 This traditional dish from the Caribbean is a combination of rice and red kidney beans, which are are usually called peas, rather than green peas. The mixture is cooked in coconut milk making it slightly sweet and fragrant. It is lovely served with any foods from the Caribbean. I always serve it with Salt Fish Cakes, which I make using a recipe given by our friend Hyacinth, Fried Plantain and a few green peas or some salad leaves. The original recipe, which was very successful but results in a dish with a fairly sticky consistency, comes from A Sainsbury Cookbook: The Cooking of the Caribbean by Elizabeth Lambert Ortiz. The only ingredient changes I made were to substitute a tin of red kidney beans in place of dried beans, to use creamed coconut (readily available in block form) dissolved in water in place of coconut milk and some adjustments to the ingredient proportions. After making Rice and Peas in a pan using the original recipe I successfully adapted the recipe for my rice cooker, using the same ingredients. The resulting rice was much less sticky. Try it both ways if you have access to a rice cooker and see which you prefer: both methods are given below. 1. Heat the oil and gently fry the onion until golden. Stir in the chilli, thyme and rice. 2. Thoroughly dissolve the creamed coconut in the hot water and mix in. Bring to the boil and cook over a very gentle heat for about 30 minutes, stirring occasionally to check that it is not sticking. Before the liquid is completely dissolved stir in the drained and rinsed kidney beans, adding a small amount of additional water if necessary. Continue to cook until the rice and peas are tender, the liquid is absorbed and the beans are heated through. 3. Stir occasionally to make sure the mixture does not stick to the pan. As the higher sugar content of the mixture means it could stick and burn it should be served almost immediately. Rice and peas can be kept warm for a short time, but cooked rice should not be stored at room temperature for a prolonged period. 1. Place the rice, onion, chilli, thyme and oil in the cooker pan. Thoroughly dissolve the creamed coconut in the hot water and pour over the rice. 2. Set to rice cooker to cook. Before the liquid is completely dissolved stir in the drained and rinsed kidney beans, adding a small amount of additional water if necessary which will give a stickier consistency to the finished dish. Stir occasionally to make sure the rice and peas do not begin to stick to the pan. Continue to cook until the rice and peas are tender, the liquid is absorbed and the beans are heated through. 3. It is not possible to use the usual keep warm facility in the rice cooker, apart for a very short period. As the higher sugar content of the mixture means it could stick to the bottom of the pan and burn it should be served almost immediately. Rice and peas can be kept warm for a short time, but cooked rice should not be stored at room temperature for a prolonged period. 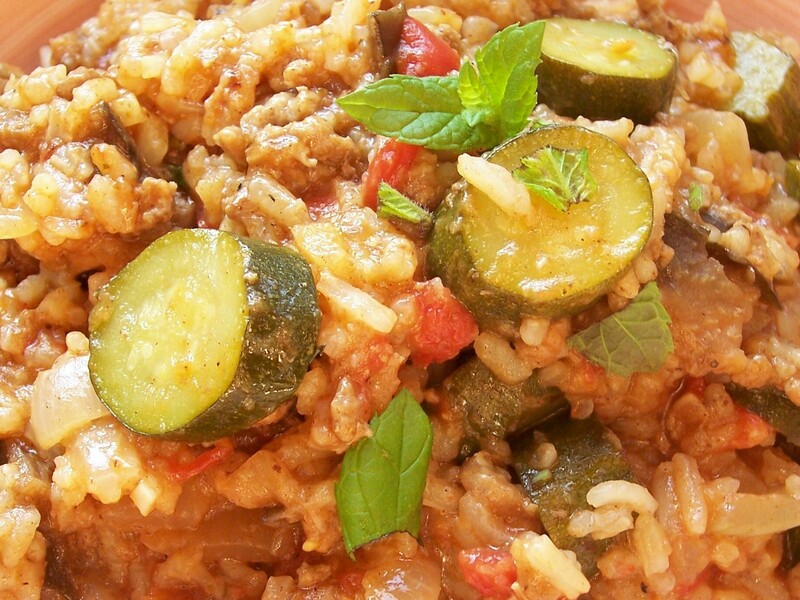 This is a very simple and creamy risotto and the cooked cucumber is a revelation! The recipe breaks the normal rules of risotto making as you can add all the liquid together rather than the usual rule of adding it gradually. If you want an extra special dish then you could use Carnaroli rice, but I think Arborio is fine. I have cooked cucumber before, but a long time ago. I seem to remember it made a delicious sauce that went with fish, though I cannot remember either the type of fish or the location of the recipe. You could mistakenly think that courgette could be substituted, but cooked cucumber is nothing like it. It could be used as an alternative, but courgette would make this a completely different dish. The original recipe adapted from a book I found in the library, Cooking with Salmon, the King of Fish by Jane Bamforth. I had some fennel in the fridge, always a good partner with fish, so I decided to add this. As the fish is diced for the recipe use fresh salmon offcuts if available. The original recipe suggested just using the white parts of the spring onions, but I could not see why the green tops could not be used as well! The seasoning needs to be checked carefully otherwise the risotto could be rather bland. Next time I make this – and I am sure I will – I will replace the tarragon with lemon juice and zest, which I think will add a lovely tang. 1. Melt the butter in a pan and gently fry the onion, fennel and cucumber for about 2 minutes without browning the vegetables. 2. Stir in the rice and pour in the stock and wine. Bring to the boil and then simmer uncovered for 10minutes. Stir occasionally. 3. Stir in the diced salmon and season. Continue cooking for another 5 minutes. Switch off the heat, put lid on the pan and leave the risotto to stand for another 5 minutes. 4. Uncover the pan and stir in the tarragon. Serve in bowls. Add crusty bread if you wish. Kedgeree comes from Anglo-Indian origins, being conceived by the colonials of the British Raj in the 19th Century using the spices which were freely available in India. The recipe was then brought home to be enjoyed by Victorian families. It was, and still is, usually eaten at breakfast, more commonly now on restaurant menus, but it can also be a light main course or served in a small portion as a starter. At its simplest it is just a mixture of long grain rice, fish (usually smoked haddock) and hard boiled eggs. It is easy to just blindly follow a recipe without variation, but sometimes it is good to combine the best bits of several recipes which is how this dish came about. I rarely add fruit to main courses as I dislike the combination of sweetness with meat or fish, but as these are commonly added to Anglo-Indian dishes I thought I would try adding some raisins and was pleasantly surprised. Just a few, mind, more for me would have made it too sweet. One recipe was a very basic version, but buttery and using Madras Curry powder, the quantity of which gave a surprisingly mild flavour. The second recipe suggested using salmon in place of the usual smoked haddock, so I used a combination of both fish. It also used cayenne pepper rather than curry powder, which is more traditional. The third recipe was for a special version using raisins and canned pineapple, which was a step too far for me! The addition of frozen peas and toasted split almonds are my own version. I was very pleased with the results. We would definitely eat this again. The only complaint was that there could have been more, so I have altered the proportions of some of the ingredients. The three books I consulted are: Delia Smith’s Complete Cookery Course (Buttery Kedgeree – the ingredient quantities were mainly based on this recipe); Leith’s Cookery Bible: Completely Revised & Updated Edition – Prue Leith & Caroline Waldegrave (Kedgeree – with its suggestion of using salmon); Sainsbury’s 50 Suggestions for Rice – Susie Ward (Noble Kedgeree – which suggested the sultanas). The recipe title is my own. I looked up the difference between Pilaf and Risotto and decided that it was a Pilaf. (Pilaf has the liquid added all together, whereas true Risotto can be complicated as the liquid is added gradually and stirred.) As I had used two types of fish, with added nuts and raisins as well, I felt that made it special! 1. Measure out the rice in a measuring jug and transfer to another container. 3. Place the fish in a pan, cover with cold water, bring to the boil, cover and simmer gently for about 8 minutes. Remove the fish and cover to keep warm. Drain the fishy water into the measuring jug to use later and continue to use the same pan. Top up with boiling water if you do not have enough fishy water. 4. Melt ½oz of the butter with the oil in the pan and gently fry the onion. Stir in the curry powder and the rice and then add the measured liquid and finally the peas. Bring to a boil, stir, cover and then turn down to a low simmer. Cook for 10 minutes. 5. Skin, bone and flake the fish. Shell and chop the egg. Stir the fish pieces, chopped egg, sultanas, lemon juice, remaining ½oz of butter, cream (if using) and seasoning as required into the rice mixture and replace the lid. Continue to cook until heated through and the rice grains are tender. 6. Toast the split almonds under the grill watching carefully as they burn quickly. 7. Serve in bowls with a sprinkling of chopped parsley and toasted almonds to garnish. Easily cooked comfort food for the cold weather – lovely served with bacon, a gammon steak or a pork chop. Also makes a good vegetarian lunch. Adapted from a recipe cut from a magazine, but I have no idea which one! Works equally as well just cooked on the hob in a saucepan, but if you want to bake in the oven then pre-heat to 180oC/350oF/Gas4. 1. Melt the butter and oil in a heavy pan. Fry the onion for about 5-10minutes until soft and transparent (not browned). 2. Turn up the heat slightly, add rice and stir to coat thoroughly. 3. Add puree and chopped tomatoes and stir well. 4. Add the stock, stir, bring to the boil and turn down to simmer (uncovered). 6. Stir in the basil and most of the cheese reserving some (preferably a little of the Parmesan) for sprinkling on top at the table. 7. Season and leave to stand so the cheese melts a little before serving.